Boulder Creek is a minor trailhead in the Trinity Alps that sees only modest traffic even at the busiest of times. There are some nice lakes found at the headwaters five miles from the Coffee Creek start but these can be reached by easier means utilizing Forest Service roads east of Boulder Creek. From past experience I'd found these roads challenging for the van and didn't want to put it through more abuse to save a few miles. My primary destination was Peak 8,081ft, a P1K above Conway and Lion Lakes, on the crest with the Swift Creek drainage to the south. With a few bonus peaks thrown in it would amount to 6,000ft+ of gain over 16mi, not a bad day's work. I was happy to be staying put for a second night back at the TH where I would meet Bob Sumner who planned to hike with me the next day, and would easily have enough daylight even with a not-so-early start after 8a. The hike up Boulder Creek starts out on a dirt road that services a handful of small inholdings just inside the gate. I met up with one of the landowners unlocking the gate to get his truck in when I started. He was a pleasant fellow, recommending I visit a nice waterfall near his property and wished me well on my hike. Shortly past the gate the trail moves to a single track on the right side and begins a long climb up the moderately steep drainage, climbing more than 2,000ft in 4mi to a trail junction. The left fork goes up the east side of the drainage to Boulder Lake while the right fork which I followed goes over the crest to the Union Creek drainage. Here the trail grows much steeper, climbing another 2,000ft+ in 2.5mi. Buried in the forest up until this time, the views begin to open up as the trail climbs the west side of the drainage, passing another trail junction leading down to the diminutive Conway Lake and the larger Lion Lake. It was not long after 11a when I reached the pass separating Boulder and Union Creeks. Picturesque Foster Lake lies just below the crest to the west while my goal, Peak 8,081ft, rises 600ft above the pass about half a mile south along the crest. The cross-country took a little less than half an hour, starting off as easy class 2 but presenting some class 3 scrambling before long, some of it quite interesting along the crest near the top. 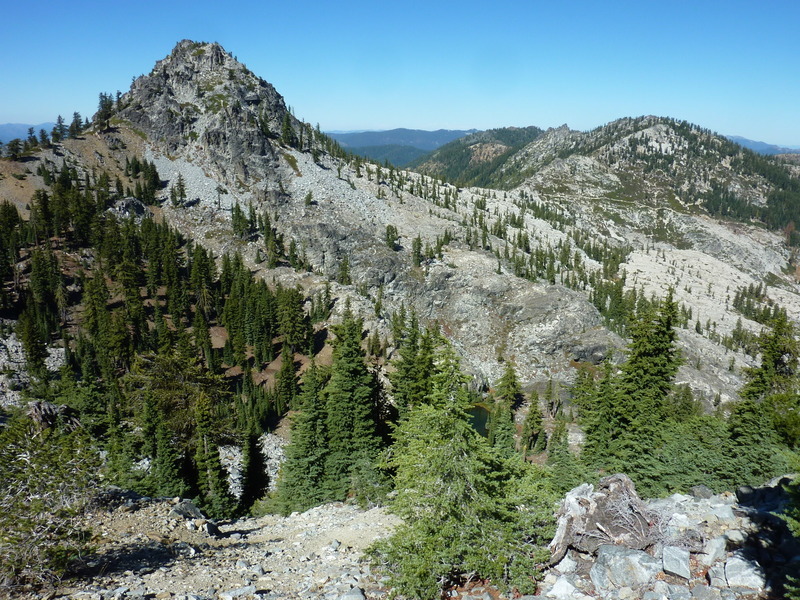 A Forest Service benchmark is found at the summit along with some fine views overlooking the higher summits of the Trinity Alps to the southeast and south. To the north were the other two summits I planned to visit before returning, Peak 8,033ft and Sugar Pine Butte. To the east, about 1/3mi distance, rises Pt. 8,037ft. It doesn't have enough prominence to qualify as a separate summit but the traverse between the two looked interesting enough that I decided to pay it a visit. The traverse drops something more than 200ft over broken granite rock before starting up from a saddle, avoiding brush for pretty much the whole way. Half an hour later I was at this lower point (with a better view of the Boulder Creek drainage, otherwise not much different from Peak 8,081ft) where I quickly tagged the summit and returned to the saddle between the two. Not wanting to return back over 8,081ft if I could avoid it, I thought I might drop down into the Union Creek drainage to pick up a trail to bring me back up to Foster Lake and the pass I had first ascended - a bit of a tactical error, it turns out. Had I looked at the GPSr carefully I would have noted this would require a drop of some 1,700ft, but looking at it from the saddle it didn't seem all that far down and I hardly appreciated the extra effort this would require. After dropping about 400ft off the saddle I began to understand the magnitude of the undertaking and decided it was more than I wanted to chew off today. Trying to cut my losses, I began contouring around the west side of Peak 8,081ft, eventually climbing back up to the crest north of the highpoint but not after some loose sidehilling and modest bushwhacking. The net result was a lot of work for little gain. Such is life. Back at the pass above Lion and Foster Lakes, I continued north along the crest towards the two bonus peaks. The topo map shows a point with an elevation around 8,060ft that would mark the highest point on the crest north of the pass, if it actually existed. There is a bump along the crest there, but apparently there are more contours drawn on the map than called for, as the point is well below another point further north with a spot elevation of 8,033ft. I climbed this latter point to its rocky perch and snapped a few photos before turning my attention to Sugar Pine Butte. This last summit turned out to be the most interesting one of the day. There is some fine class 3 scrambling to be found up from the saddle between the two summits but the real deal are the final summit rocks. The lower western one is a stiff class 3 effort but the higher east block only a few yards away is a nervy class 4 pedestal that appears unclimbable by ordinary means on three sides. Its west side has a small ledge only inches wide that allows a carefully orchestrated move up to the top - not for the faint of heart and to date the hardest summit I've run across in the Trinities. A benchmark is found lower on the east side of the block as was a register in a white PVC tube. Unfortunately the register was completely waterlogged and unreadable, rendering it useless.